In some cases the screen may show the wrong resolution. Restart your Apple TV to return it to the correct resolution. Netflix videos may not resume where you left off. FIXED: Some videos may not resume after fast-forwarding or rewinding. Press the Menu button on the remote to back out and play the video again. FIXED: The Play/Pause button may not pause music that is playing in the background. Go to the Now Playing screen to pause music. The History list in the YouTube app gets cleared when you exit and reenter the app. FIXED: Peer-to-peer connectivity will not work under certain network conditions, including devices being behind double-NAT topologies, connecting between AT&T and Verizon networks, or connecting with an international carrier. FIXED: The Game Center friend request UI may hang for up to 10 seconds, and may become unresponsive. Quitting and relaunching the app will resolve this issue. FIXED: Viewing the game invite or automatch UI inside your app may crash it when not in the Game Center Sandbox environment. Games using Sandbox will not be affected. FIXED: Turn timeouts in turn-based games will be 1/1000 of what is specified when calling the endTurnWithNextParticipants:turnTimeout:matchData:completionHandler: method of GKTurnBasedMatch. This will be fixed in a future seed. FIXED: When running Game Center-enabled apps in iOS Simulator, developers logging into Game Center are interacting with the live production server and data. To work around this problem, developers working on new projects as well as projects that require iTunesConnect metadata should work on actual devices instead of the simulator. Developers who have published apps already in the App Store and who wish to develop using the simulator can use the new iOS 6 features; however, they must be aware they are interacting with live production players, scores and achievements. FIXED: Setup Assistant will crash if a new account is created during initial setup. The account will actually be created, and the user can login and use it afterwards. The crash does not happen with existing accounts. The Answer and Decline buttons are missing when receiving calls in landscape orientations. FIXED: If you erase restore your device, you need to reboot your device in order to send attachments through iMessage. FIXED: If you change your password for iMessage or FaceTime, you must toggle these services off and on again in settings. For iMessage, toggle the Settings > Messages > iMessage switch. For FaceTime, toggle the Settings > FaceTime > FaceTime switch. FIXED: SpringBoard/BackBoard may crash during a phone call if the screen fades to black when using speakerphone or headphones. FIXED: Wi-Fi Sync with iOS 6 and iTunes 10.6.3 does not work when the device is locked and not connected to power. It can sometimes fail even when connected to power. In that case, rebooting the device may resolve the issue. When restoring from an iTunes backup, the device intermittently shows up as new device after rebooting. If that happens, set up the device as a “new device” when prompted to restore for the 2nd time. All data should have been restored correctly but sync settings including App arrangement in iTunes are lost. If Maps is not running in the background, a “Maps cannot connect to the internet” error is displayed when it is launched from a 3rd party app. If Maps has not yet been launched, the current location does not show up when it is launched from a 3rd-party app. Testing and debugging of coverage files for routing apps is only supported during development through the Xcode “Run” workflow. (You can specify the coverage file for a given Run scheme using the Options pane of the Run section of the scheme editor.) Apps that are archived and distributed (outside of the App Store) onto devices will not have access to the app’s coverage files. FIXED: After restoring videos from an iCloud backup, the video thumbnails for all titles display the same poster image (obtained from one of the titles in the list), as opposed to each displaying its own poster image. Developers can set a “purpose” string for each class of isolated data. iOS displays this string to users to help them understand why their data is being requested. These strings can be added using Xcode’s Project editor, in the Info tab. The relevant key names begin with the string “Privacy -”. FIXED: The back button for navigation controllers on the Retina iOS Simulators does not render properly. The app delete confirmation alert panel takes a while to show up on the iOS Simulator. Tapping the buy button in the view of an SKStoreProductViewController object in iOS Simulator causes the app to crash. Using the iOS 5.1 SDK with the iPad (Retina) profile will result in a SpringBoard crash. The iOS 5.1 SDK works with all other profiles and the iPad (Retina) SDK works with the iOS 6.0 SDK. Ads of type ADAdTypeMediumRectangle do not appear in iPad Simulator. After restoring a device in iTunes or performing an “Erase All Contents and Settings”, the current wallpaper may not appear until the device is rebooted once. An airplane icon appears between the origin and destination for all transit types. FIXED: SpringBoard sometimes suspends ShoeboxUIService while ingesting passes. The workaround is to try ingesting the pass again. The “Description” field is now a required field for a Pass. All passes created without it will fail to validate and will not ingest. The Passbook database has been reset. You’ll need to add your passes again. In 5.1 the UISplitViewController class adopts the sliding presentation style when presenting the left view (previously only seen in Mail). This style is used when presentation is initiated either by the existing bar button item provided by the delegate methods or by a swipe gesture within the right view. No additional API adoption is required to obtain this behavior, and all existing API, including that of the UIPopoverController instance provided by the delegate, will continue to work as before. If the gesture would be insupportable in your app, setting thepresentsWithGesture property of your split view controller to NO disables the gesture. However, disabling the gesture is discouraged because its use preserves a consistent user experience across all apps. Developers trying out Auto Layout with UIScrollView objects might notice jitters in the scroll indicators on devices with Retina displays. A view controller’s supported interface orientations can change over time. Even an app’s supported interface orientations can change over time. The system asks both the topmost full screen view controller (typically the root view controller) for its supported interface orientations whenever the device rotates or whenever a view controller is presented with the full screen modal presentation style. Moreover the supported orientations are retrieved only if this view controller returns YES from its shouldAutorotate method. The system intersects the view controller’s supported orientations with the app’s supported orientations (as determined by the Info.plist file or the app delegate’s application:supportedInterfaceOrientationsForWindow: method) to determine whether to rotate. In certain situations, the Auto Layout system might not engage automatically for a view. To workaround this problem, override the requiresConstraintBasedLayout class method in your view and return YES from your implementation. FIXED: Calling any of the NSString drawing methods without specifying a value for the NSFontAttributeName attribute is likely to throw an exception. The workaround is to set a value for the NSFontAttributeName key before drawing or sizing an NSAttributedString object. Setting values for the shadowOffset or shadowColor properties of a UILabel object whose attributedText property contains a valid attributed string is unsupported. Use the NSShadowAttributeName attribute of the attributed string to set the shadow instead. The setContentStretch: method of UIView has been deprecated in this beta release. To achieve the same effect, use UIImage’s resizableImageWithCapInsets: API and display the image with a UIImageView. There is a known issue with dictionaries when attempting to define a word in any language other than English or Japanese. When the reference library is presented, the user is presented with the option to download a dictionary, but that download may not begin. The user can tap outside the popover on an iPad or tap the Done button on the iPhone or iPod touch to dismiss the download request. Support has been added for tags in web forms. Users can upload existing photos and videos from their photo library or take a picture or video using the camera. Previously this form control was always disabled. FIXED: In iOS 6 beta 1, Smart App Banners in Safari show App Store information for an app above web content. In this seed, the app launching UI and functionality portion of Smart App Banners is not available. FIXED: Users may notice that the key clicking sounds are skipped during fast typing. FIXED: Displaying a keyboard in a landscape orientation, then rotating the device to a portrait orientation results in a badly positioned keyboard. Dismissing the keyboard and redisplaying it in portrait mode should resolve the issue. 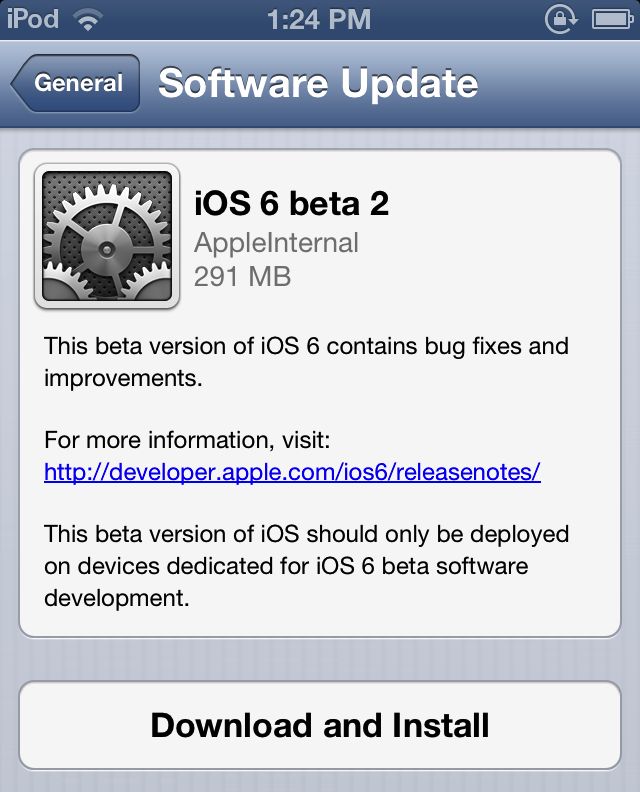 The problem affects only iOS 6 beta 1 and will be fixed in subsequent release.